Without any warning to dedicated Google SMS searchers, Google has discontinued the the ability for you to send a text message to Google and get a response. Google has completely turned off the SMS search feature telling searchers to search at google.com instead. Closing products always involves tough choices, but we do think very hard about each decision and its implications for our users. Streamlining our services enables us to focus on creating beautiful technology that will improve people’s lives. Truth is, I am not sure why Google did not warn users weeks or months in advance. Did I miss the warning? Did they announce this was closing? There are currently over 70 posts in the thread from unhappy Google SMS users. 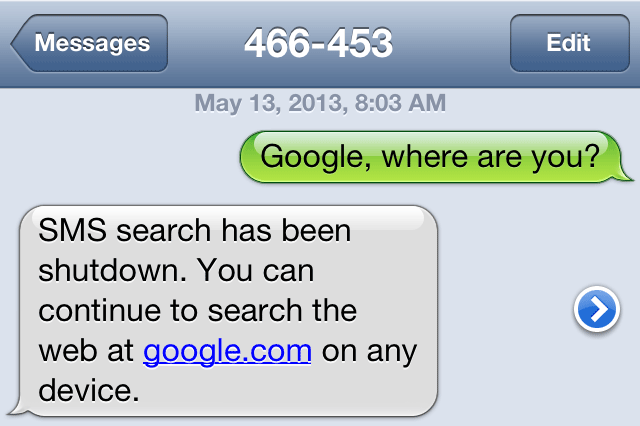 Google SMS had plenty of issues throughout the years. But we had no indication that this was coming.